In addition to the Challenger Adventures proper, there is another story that features a character who makes but a cameo in The Lost World: Dr. Meldrum. In chapter 5, during the famous speech Challenger gives at the Zoological Society, we have our only mention of this person. "Thus, when old Dr. Meldrum, with his well-known curly-brimmed opera-hat, appeared on the platform, there was such a universal query of 'Where did you get that tile?' that he hurriedly removed it, and concealed it furtively under his chair." This must have been in his older days, after the adventure told in The Fiend of the Cooperage. In this short story, a lepidopterist named Meldrum visits a British trading post on the African coast where every 3 nights, a guard goes missing from the cooperage (guardhouse). Our dear Meldrum decides to join the men of the post in staying the night in the building and helping them uncover this mystery. It isn't at all clear if this is the same Meldrum seen briefly in The Lost World, but it certainly wets one's appetite to find out if Drs. Wadley, Ronald Murray, Illingsworth, and Waldron, also of The Lost World, have their own tales. 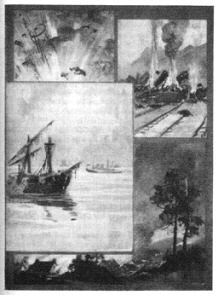 If The Poison Belt is assumed to take place within a year of its publication in 1913, and on the third anniversary of the original Challenger Expedition, then it suggests that the events of The Lost World take place in roughly 1908/1909. This, in fact, is the year derived by Roy Pilot in The Annotated Lost World based on a month and weekday date given in the text. Ether theory figures several times in the Challenger Adventures, and perhaps requires an explanation. In the Victorian era, it was discovered that light was a wave (now we understand light to have both the properties of a wave and a particle), so it was reasoned that a wave must have something to travel through. Sound, for example, travels through air, and mechanical force can travel through any object, such as waves in water. But light seemed to be able to travel where there was no air or nothing of any kind: the vacumn between planets. With everything else calculated out, scientists proposed that there existed a substance they called "ether" or "luminiferous ether" through which light waves travelled. This ether was so tenuous that whole planets could pass through it unimpeded, and ether could travel through solid objects. Ether was also seen as a possible source of energy and reactionless motion drive. But with the advent of relativistic and quantum physics in the 20th century, this theory went by the wayside. As the odd-one-out of the Challenger Adventures, this text deserves its own analysis. An article by the Thunder Child reviewing a 1950's theatrical version of The Poison Belt. George E. Challenger's Mysterious World. This role-playing game supplement for Forgotten Futures has provided the complete text of all 5 Challenger Adventures. Naturally, Malone's newspaper, the Gazette, also turns up now and then. One story, The Three Correspondents, has a fellow reporter of the unmentioned Malone scooping the reporters of the Intelligence and the Courier, after they thought he was left for dead. 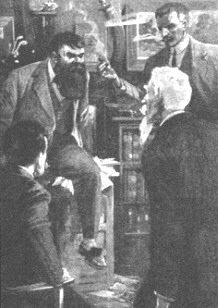 The Lost World proved to be such a smashingly successful story and Professor Challenger such a popular character that Sir Arthur Conan Doyle returned to the character (and his foil Edward Malone) in another proper novel, a "noncanonical" novel on Spiritualism and two short stories published only a few years before his passing. The first of these was The Poison Belt,published in The Strand in 1913. The Poison Belt picks up on the exploits of "The Group of the Lost World" - Challenger, Malone, Roxton and Summerlee - on the third anniversary of their first adventure. Gathering for their annual reunion amidst strange goings on around the globe, the infallible Professor Challenger presents them with the possibility of a horror on an unimaginable scale: the Earth is passing through a belt of poisonous ether that will kill everything upon it. At this late stage, as the planet is passing into the belt, the only people with a chance of survival is this Group of the Lost World, thanks to the advance planning of Challenger's hermetically sealed room. Outside the windows that keep in the fresh oxygen delivered by stockpiled canister, the Group sees the unfolding terror of a world that is quickly choking to death, left desolate in the wake of the poison belt. A very early entry into the genre of post-apocalyptic Science Fiction, The Poison Belt is radically different from The Lost World. While The Lost World is a meticulously crafted adventure story pulling in countless references from palaeontology and exotic exploration, The Poison Belt is a more introspective and philosophical text. No doubt this had a lot to do with it being written on the fly after the success of The Lost World, but nevertheless, the science of ether theory takes back stage to the characters' ruminations on life and death as the world outside their windows suffocates and collapses. There is also no doubt that this fictional look at the extinction of humanity came on the eve of The Great War. There are many aspects of it that hold out both hope and caution as political tensions boiled over in Europe. After The Poison Belt, Conan Doyle wouldn't write another Challenger Adventure for 13 years. What exactly prompted him to put pen to paper again for 1926's The Land of Mist may never be known. However, that it is but a year after the release of the smash hit silent film version of The Lost World is certainly suggestive. Perhaps Conan Doyle was looking to capitalize on the renewed interest in the Challenger character and his adventures. Unfortunately, he chose a radically different take for The Land of Mist, pulling Challenger and an unwitting public screaming headlong into a tract for Spiritualism. The "noncanonical" story of the series, The Land of Mist is distinguished from the rest of the Challenger Adventures both by its continuity (which negates the previous two novels and is in tun negated by following stories) and tone. Introducing Ed Malone to Challenger's heretofore unknown daughter Enid, the two then follow a series of disjointed events and situations that eventually lead to the conversion of all parties involved to the cause of Spiritualism. The public didn't much care for this treatment of Challenger and saw right through the ruse. 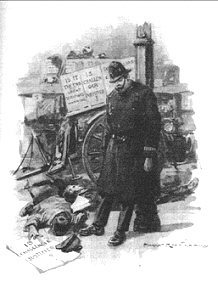 Once more, they complained, Conan Doyle was beating the hobby horse he rode ever since losing his son in WWI. The story was reviled and eventually Conan Doyle was forced to overturn it with the final two Challenger Adventures. Realizing the error he made in The Land of Mist, Conan Doyle sets things back to normal in 1927's The Disintegration Machine. This comedic short story has Challenger match wits with an evil mad scientist who invented the titular weapon of mass destruction. The final, and certainly climactic, Challenger Adventure is 1928's When the World Screamed. The short story is presented as the account of an aquifer driller hired by Challenger to create a massive drilling rig designed to reach down further than any excavation has before. But rather than attempting to reach oil, minerals or a hidden innner earth populated by more dinosaurs, Challenger has theorized that the planet itself is a giant organism not unlike a sea urchin. His ambition is to become the first person to pierce this rocky mantle and make this giant life form aware of the existence of humanity. When the World Screamed is sometimes touted as a proto-environmentalist story with an understanding as the ecosystem as a giant, interdependent, symbolic organism. This approach, while working well for environmental consciousness today, seems too much like selectively reading back upon the text. Far more imposing is the image of masculine violation of the world-organism for the benefit of Challenger's ego... This journey to the fleshy centre of the earth is ultimately most gratifying to Challenger, who triumphed not only over all humanity, but over nature itself. And as it goes, that's a Hell of a way to close out the series! Saddly, Conan Doyle passed away only two years after the greatest victory of his favourite creation.